We are delighted to announce that our charity partner for 2018/2019 is Scottish SPCA. This Scottish Animal Week (3-9 September) Scotmid Co-operative has announced the Scottish SPCA as their 2018/19 Charity of the Year. 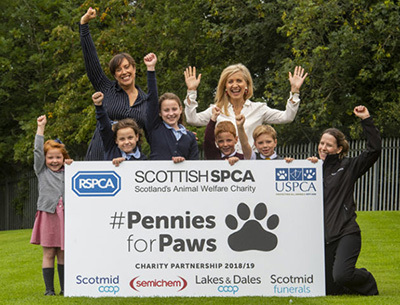 The partnership between Scotland’s animal welfare charity and the community retailer aims to not only raise £300,000 but also increase awareness of the vital work the charity carries out in local communities across Scotland, with a particular focus on educating primary schoolchildren and adults on animal welfare. Staff across Scotmid’s 177 stores, Semichem’s 72 stores and 15 Scotmid Co-op Funerals’ offices in Scotland will take part in various fundraising activities including bake sales, sponsored dog walks, an abseil, zip slide, triathlons and much more to support the animal charity. Kirsteen Campbell, Chief Executive of Scottish SPCA, said: “We are absolutely thrilled to partner with Scotmid and are so thankful for their support. “The partnership provides endless opportunities to raise awareness of our services, educate people on good animal welfare, encourage support for campaigns and of course raise much needed funds! John Brodie, Chief Executive of Scotmid Cooperative, said: “We are really excited to announce our Charity of the Year partnership with the Scottish SPCA. The target of this year’s partnership will be to raise money to fund an education programme aimed at preventing animal cruelty through education. “This Charity of the Year partnership is something different to anything we’ve done before, but it is a cause that resonates with our staff, members and customers. Main image caption (back row, left to right): Scotmid Membership Officer Lynne Ogg, Scottish SPCA Chief Executive Kirsteen Campbell. 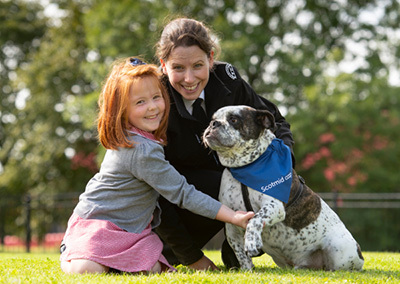 Above image caption (left to right): Primary schoolgirl Orlaith Sleight, Scottish SPCA Head of Education and Policy Gilly Mendes Ferreira and Elvis the dog at the launch of Scotmid’s Charity of the Year partnership with the Scottish SPCA.